No weakness that I am aware of, just a sweet pair of vintage speakers that were never used....with a good enough range to enjoy. pretty loud with good sound quality. I bought these speakers only because they were twenty dollars. All I know is that I got a good deal because these speakers kick a$$. The look pretty cool. Not too bad for the price though. No bass, midrange was alright. Treble was pretty good. But all in all they sounded a bit tinny. 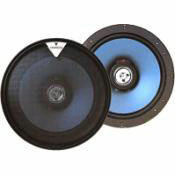 Just bought these to upgrade from factory speakers and I really couldn''t tell that much difference. I didn''t have them hooked up to an amp, but for basic speakers like this I shouldn''t have to (130 W Peak). I used them in the rear of a Ford Fairmont, but I may put them in front of my new car to replace the factory speakers - will be interesting to see how they perform. I would probably spend up to the next bracket, but if you can''t afford that - they''ll probably be alright. A couple of my mates have used Hertz and Clarion - but their speakers have been alot more expensive and hence better.